To begin, grab the end of your memory wire at the tips of your round nose pliers. Turn the wire to make a loop. Trim any sharp wire ends. String on a silver ball. Cut the rubber tubing into 1 1/2" - 2" pieces. String a piece of tubing onto the memory wire.String a ceramic bead with a silver ball on each side. 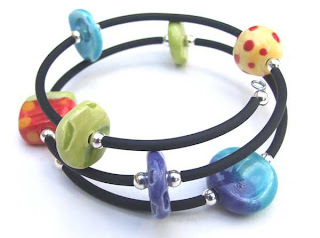 Continue to string a piece of tubing, ball, ceramic, ball, until the bracelet has all of the beads on it. Finish by stringing on one last silver ball. Trim the wire leaving approximately 1/2 inch of wire at the end. Create a loop just as you did in step one. Keep rolling up the wire until the beads are snug.